Congratulations on your top 10 finish. Very nice shot! Nice that you got two sports at once. Nice idea, good low perspective, deep DOF, sharpness, and colors. Wish that the lights were less blooming in your face, but I think that the overall image is strong, including the tilted horizon, for once. Hope it does well. ok.this the best shot ive seen until now.Good colours, good composition. I love the numbers at the bottom. I love this photograph. I like the track in the foreground. This is a first place photo. I vote a 10. This would be a great entry it were in focus and had greater depth of field. I really like the contrast between the black sky and the stadium lights. I also like the way the black track sets the field apart. And all the lines moving diagonally really gives this motion and interest. Great job otherwise. Nice Shot...Love the commanding feel. 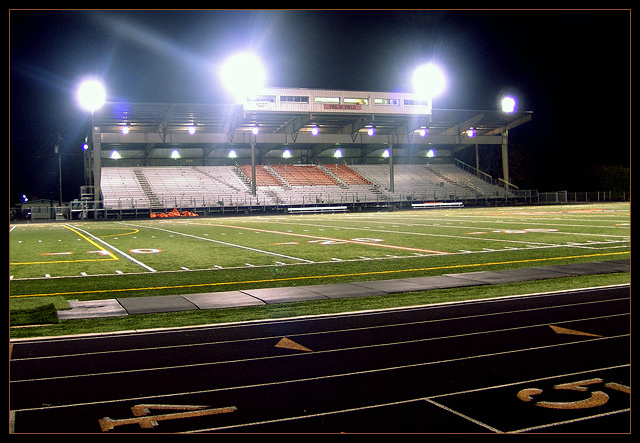 I like this image particularly because the track and the football field are so well lit. The track is my favourite part. Proudly hosted by Sargasso Networks. Current Server Time: 04/21/2019 03:02:42 AM EDT.